Bosnia and Herzegovina's declaration of sovereignty in October 1991 was followed by a declaration of independence from the former Yugoslavia on 3 March 1992 after a referendum boycotted by ethnic Serbs. The Bosnian Serbs - supported by neighboring Serbia and Montenegro - responded with armed resistance aimed at partitioning the republic along ethnic lines and joining Serb-held areas to form a "Greater Serbia." In March 1994, Bosniaks and Croats reduced the number of warring factions from three to two by signing an agreement creating a joint Bosniak/Croat Federation of Bosnia and Herzegovina. On 21 November 1995, in Dayton, Ohio, the warring parties initialed a peace agreement that brought to a halt three years of interethnic civil strife (the final agreement was signed in Paris on 14 December 1995). The Dayton Peace Accords retained Bosnia and Herzegovina's international boundaries and created a joint multi-ethnic and democratic government charged with conducting foreign, diplomatic, and fiscal policy. Also recognized was a second tier of government comprised of two entities roughly equal in size: the Bosniak/Croat Federation of Bosnia and Herzegovina and the Bosnian Serb-led Republika Srpska (RS). The Federation and RS governments were charged with overseeing most government functions. The Office of the High Representative (OHR) was established to oversee the implementation of the civilian aspects of the agreement. In 1995-96, a NATO-led international peacekeeping force (IFOR) of 60,000 troops served in Bosnia to implement and monitor the military aspects of the agreement. IFOR was succeeded by a smaller, NATO-led Stabilization Force (SFOR) whose mission was to deter renewed hostilities. European Union peacekeeping troops (EUFOR) replaced SFOR in December 2004; their mission is to maintain peace and stability throughout the country. EUFOR's mission changed from peacekeeping to civil policing in October 2007, with its presence reduced from nearly 7,000 to less than 2,500 troops. For silver and base metal coins of Bosnia Herzegovina, please look at our original Chard Coins website. 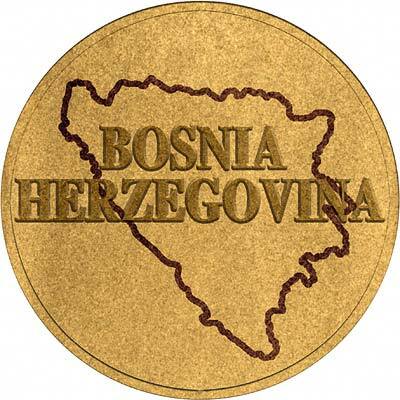 We make an active market in almost all world coins, gold or otherwise, including Bosnia Herzegovina gold coins. If you have any of these coins to sell, please contact us, or post them to us for appraisal and offer.